‘Beating the Bridges: Richmond to Dartford’ by filmmaker and LCC Professor of Film William Raban is showing in a film installation as part of the Museum of London Docklands’ current ‘Bridge’ exhibition. The free exhibition, which draws on the museum’s art collections to consider the significance of bridges within the London landscape, is open now until Sunday 2 November. As well as exploring how London’s bridges allow people to experience the city, the show looks ahead to projects such as Thomas Heatherwick’s ambitious ‘Garden Bridge’ proposal, playing with the ideas of destination and crossing and tackling the key debates surrounding London and its bridges. William’s 1998 film follows the Thames from the wealthy suburbs of west London, past the familiar landmarks of Chelsea, Westminster and the City, to the industrial flatlands beyond Dartford Bridge. The 30 bridges spanning this stretch of the river provide acoustic spaces filled on the film’s soundtrack by ambient reverb and a live percussion score. 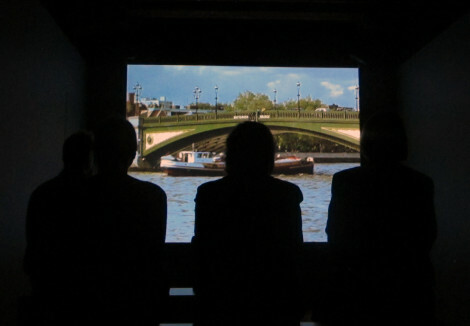 ‘Beating the Bridges’ is presented in its own screening room within the gallery and will show continuously every day. Read more about Research at London College of Communication.